Jerome Bruner's article The Narrative Construction of Reality suggests that narrative plays an important role in how man "achieves a 'true' knowledge of the world... that is to say, how we get a reliable fix on the world, a world that is... assumed to be immutable and... 'there to be observed'." But it should be noted that belief and reality often differ. In my continuing interest to explain the narrative function of crafts, I want to address one minor point of comparison. In discursive narrative, verisimilitude, or what Stephen Colbert calls "truthiness" is completely acceptable. In my interpretation of Bruner's article, discursive narrative may be based on real events or fictional, without diminishing our use of it to establish belief or to portray reality in shaping the beliefs of others. A great example is when Ronald Reagan used his movie characters' "experiences" as being valid in explaining and rationalizing positions he took in office as president. In political narrative, it has become completely acceptable to just make stuff up. I want to compare this with craftwork as narrative expression. Crafts are not about making things up, but about making real things. Narrative, as used in politics, religion and entertainment creates belief based on verisimilitude, on ideas that may appear to resemble truth from certain psychological predispositions but may not be able to pass full muster of physical reality. In other words, in discursive narrative, you get to make stuff up. In crafts, you make beautiful and useful stuff instead, and if you are interested in reality, there is no substitute for the real thing, and I'm not talking Coke. As seen in the images at left and below, I've started a new table project. 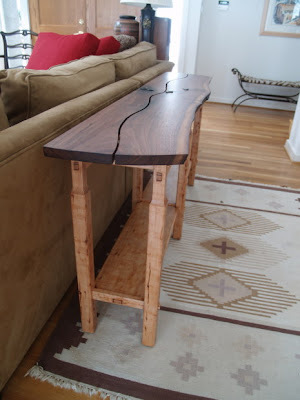 First, the shape of the table is determined by the natural edge at the front, and the natural geometry of my body as I use my arm as a compass. I plant my elbow in my left hand and swing an arc with my right arm. I know some won't buy the notion that crafts are a narrative, but I believe what I do in my work is story told describing the intersection of the material, the human body involved in creative process and the imagination stemming from "mind" which is actually a cultural expression. Next as seen below, I use a jig saw to cut the shape, and then use the same saw to cut a meandering line down the middle which will allow the board to pass through the planer and also be rejoined, surrounding the sliding dovetails that attach it to the base. More photos of this project will be shown as I make further progress. 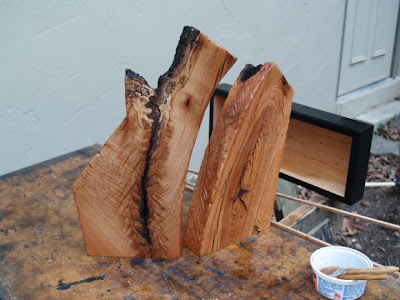 The wood is spalted maple, cut with waney or natural edges left in tact. The 7th, 8th and 9th grade students are finishing their books and beginning wood turning. The books shown are by the 7th grade students. 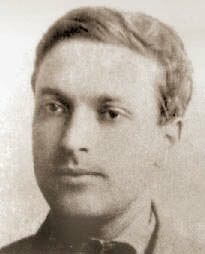 Lev Vygotsky (1896-1934) was a Russian Psychologist whose observations provide the foundation for the Pea-Perkins concept of distributed intelligence, which if you have been following the blog, helps us to understand how cognitive functioning and cognitive burden is "off-loaded" as artefact, invested in individual creative tools, and made available to new generations of artists and craftsmen. While cognitive psychologists mainly dwell on the use of discursive narrative as the building block for understanding reality, I think you will see that manipulation of tools and materials are the building blocks of language and creativity. The key premise of Vygotskian psychology is often referred to as cultural mediation. The specific knowledge gained by children through these interactions also represented the shared knowledge of a culture. This process is known as internalization. Internalization can be understood in one respect as “knowing how”. For example, riding a bicycle or pouring a cup of milk are tools of the society and initially outside and beyond the child. The mastery of these skills occurs through the activity of the child within society. 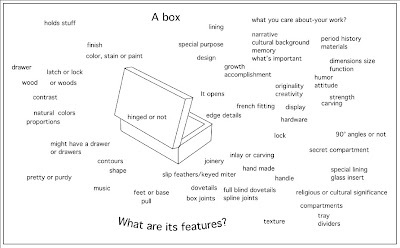 A further aspect of internalization is appropriation in which the child takes a tool and makes it his own, perhaps using it in a way unique to himself. Internalizing the use of a pencil allows the child to use it very much for his own ends rather than draw exactly what others in society have drawn previously. Guided participation, which takes place when creative thinkers interact with a knowledgeable person, is practiced around the world. Cultures may differ, though, in the goals of development. For example, Mayan mothers in Guatemala help their daughters learn to weave through guided participation. You will probably note the this form of guided participation is what happens daily in the Clear Spring School woodshop, or whenever adults introduce children to participation in crafts. Vygotsky's work is also fundamental to an understanding of the purpose of play in child development. Through play the child develops abstract meaning separate from the objects in the world, which is a critical feature in the development of higher mental functions. The child wishes to ride a horse but cannot, so he picks up a stick and stands astride of it, thus pretending he is riding a horse. The stick is a pivot. "Action according to rules begins to be determined by ideas, not by objects.... It is terribly difficult for a child to sever thought (the meaning of a word) from object. Play is a transitional stage in this direction. At that critical moment when a stick – i.e., an object – becomes a pivot for severing the meaning of horse from a real horse, one of the basic psychological structures determining the child’s relationship to reality is radically altered". As children get older, their reliance on pivots such as sticks, dolls and other toys diminishes. They have internalized these pivots as imagination and abstract concepts through which they can understand the world. "The old adage that children’s play is imagination in action can be reversed: we can say that imagination in adolescents and schoolchildren is play without action" (Vygotsky, 1978). All the preceding is from the wikipedia article on Vygotsky. I am trying to come to a point of clarity in my understanding from which the narrative function of crafts can be explained to those who believe that narrative is only a function of language use. When we understand the narrative function of art and crafts we begin to grasp the essential role that they play in human culture... And perhaps we'll be able to explain their value in language that even a scholar might understand. (pronounced /ˌproʊpri.ɵˈsɛpʃən/ PRO-pree-o-SEP-shən), from Latin proprius, meaning "one's own" and perception) is the sense of the relative position of neighbouring parts of the body. Unlike the six exteroceptive senses (sight, taste, smell, touch, hearing, and balance) by which we perceive the outside world, and interoceptive senses, by which we perceive the pain and movement of internal organs, proprioception is a third distinct sensory modality that provides feedback solely on the status of the body internally. It is the sense that indicates whether the body is moving with required effort, as well as where the various parts of the body are located in relation to each other. Sir Charles Bell, who wrote the book about the Hand, used the term muscle sense and I suspect you would have to be interested in the human hand and body for any of this to be meaningful to you. 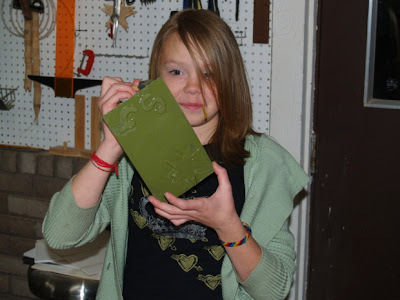 Today in the CSS wood shop, 4th, 5th and 6th grade students worked on their hand-made journals, and began making game boards to use in their travels. The Fox and Geese game boards are based on those featured in A.J. Hamler's new book on Civil War Woodworking projects. Our high school students started work on an Ark of the Covenant as part of their world religions class. Scrapwood Bob sent this link to a yurt building/spoon and bowl carving class with Bill Coperthwaite, so while I neglected to get any photos taken today while in the CSS woodshop, I'll share these above and below from Bill Coperthwaite's yurt building workshop with CSS students in 2002. Michael Pollan said that junk food is OK as long as you make your own from better ingredients. How about making Twinkies? You will at least burn a few calories in making your own and will be able to avoid the preservatives that give Twinkies a long shelf life in the grocery store. If you can make Twinkies, you might also be inspired to make a few healthier recipes, and have great fun in the kitchen. Biologists and chemists are concerned with the preservation of diverse ecosystems as the storehouse and source for biological materials that took eons to evolve. There is a race to gather plant species before they are erased by loss of habitat and changing climate. When you lose species of enzyme producing plants, you lose a whole catalogue of chemicals with potential for curing disease, for creating new materials for manufacturing or for understanding life itself. What happens when we lose the range of hand skills involved in crafts? What happens when instead of making things, children spend all their time hunched over miniature electronic devices? Do we begin to lose our human capacity for direct and effective problem solving? Take a moment and explore your own hands. You will find 10 fingers, the foundation of mathematics. In the sequential movements of thumb and fingers of one hand, you will find the human inclination to plan actions in sequence. Enmeshing the fingers of left and right hands, you will find the human inclination to integrate diverse observations into a comprehensive theoretical framework. In examining left and right as separate forms, we discover symmetry and the capacity to reproduce symmetry in design. In other words, our abilities to count, to measure, to plan, to design, and to create are gifts of the cognitive partnership between brain and hand. The hands model conception, the brain conceives, and the hands create, thus modeling further conception and creation. Should we be concerned about the human loss of hand skills and age old techniques for problem solving and creativity? Compared with the loss of whole ecosystems perhaps the threat is not so huge. And there are simple things we can do about it. If we want our children to be diminished in capacity, let's leave them hunched over their miniature electronic devices. If not, let's send them to the wood shop, where they can learn to create. Tonight we had the annual Clear Spring School fund raising auction, and there were many many original pieces of art sold at auction to benefit the school. 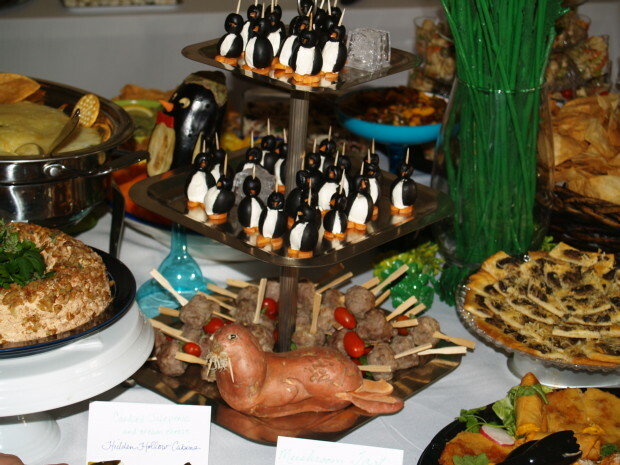 The food prepared by former Clear Spring School parents Jane Tucker and Donna Doss was amazing art as well as wonderful to taste and enjoy. 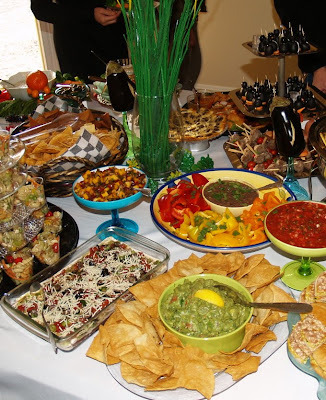 Various restaurants also contributed platters. We raised several thousand dollars to benefit Clear Spring School. What you see in the photos is only a small portion of the creativity on display. Richard Bazeley, shop teacher in Australia, sent the video below of one of his students playing student-made tongue drums. Richard had thought the drums to be a bit limited, but the student showed that by playing a number at once some very creative drumming could ensue. Tongue Drum from Richard on Vimeo. Making musical instruments is one more wonderful way that the school wood shop can enhance school culture and student enthusiasm for learning. I am generally not an advocate of TV. I would prefer doing stuff, seeing it happen in my own hands and under my own control to watching it happen on TV. I would rather cook (and eat) than watch cooking on TV. But last night I watched Jamie Oliver's Food Revolution, and I really hope the revolution takes hold in America. You may not have to watch week after week for the same message. A word to the wise might be sufficient. We(as a nation) are unhealthy, obese, we pay too much for health care, and have tragic infant mortality. We are making ourselves sick. Much of what we witness has to do with the hands. Rather than caring preparation of food to secure the health and well-being of our families and communities, we cheap and quick our way out. There is a steel wedge in the heart of our educational system. We separate those who plan on college from those who do not. We send some to universities with their hands untrained, lacking the values that hands-on creative engagement provides. The graduates of those universities run companies whose only purpose is to generate huge profits for the few, by exploiting the many whose intellectual education has been neglected. Those college trained professionals often have little understanding of the dignity and value of labor. When the manual training movement began its work in American education, women were taught the kinds of things that would lead to healthier families, and men were taught skills that would lead to industrial employment. We've taken some steps forward in terms of gender equality, but lost great ground in the health of our nation. No student, male or female should be allowed to graduate from high school or college without the capacity to prepare healthy meals for themselves and their future families. And none should graduate without some participation in skilled, creative labor. I'm finding Jeremy Kidwell's Domesticated Theology discussion of Christian carpentry and Paul's tent making to be very interesting. I think that certain core human values become lacking when we fail to be engaged in creative manual labor. To make something is an essentially moral act. It is done with care and attention to beauty and utility, or it is not. It is done with care for its ultimate user or it is not. There was a long history of Christian monks offering up their work to God... another fruitful area for theological review in that from a more selfless perspective, many believed that all being God deserved nothing less than one's best work, most prudent and honorable use of the materials at hand and that work and worship were a single expression of enlightened humanity. Finnish brain researcher, Matti Bergström, working from a non-theological perspective describes a condition he calls finger blindness. In essence, while the physically blind cannot see the outlines of the object, the finger blind, those who have not learned in childhood to create with their own hands, cannot perceive the object's intrinsic values. He says they are "values damaged". Instead of perceiving the broad range of values that a reasonable and soulful society projects, their range of perceived values becomes severely retarded. Instead of seeing an object of art and marveling at the miracle expressed by its maker, they see it only in terms of market value and price. Bergström's concept goes a long way in describing the true sources of our current economic crisis. But a review of early Christian practices, and giving credence to our children's capacities and inherent needs to create, would go a long ways toward restoring greater meaning to many lives. Cook, clean, make, create, sew, fix, make dinner, make lunch from scratch, stir, saw, hammer, shape, mold, plant, repair, design and make, make music, nurture, nurse, care. These are the words that reflect a whole world of values that we are neglecting in modern education. I have heard from a few woodworkers who have found their way to the blog due to the article in the Lee Valley Woodworking Newsletter. Welcome! You will find youtube videos of the Clear Spring Students at work here. And you will find links to some of my previously published articles Here. One reader noted the similarities between my teaching program and educational sloyd. 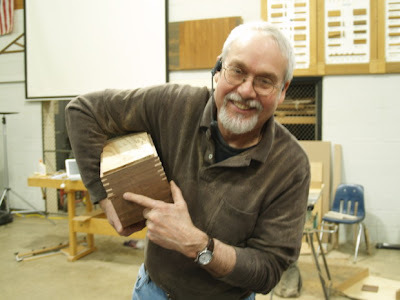 I have published a number of articles on Educational Sloyd over the past several years, bringing the subject to renewed interest among American woodworkers. These articles can be accessed through the preceding link. 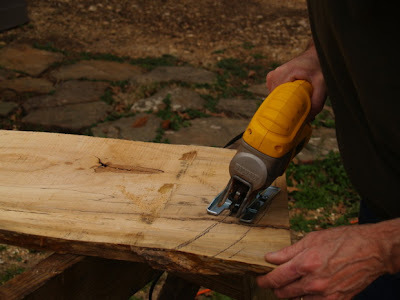 Jeremy at Domesticated Theology Blog has been commenting on Christ's involvement as a carpenter and what it meant to his theology. 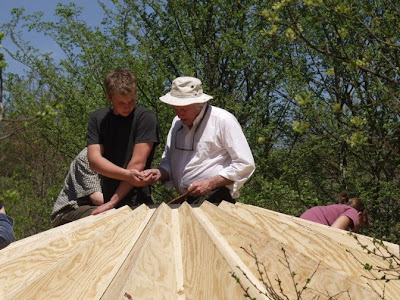 The idea is that we might come to better understand the importance of our own hands-on service to others through the example set by common craftsmen. I thank Jeremy for his thoughtful reflections on craftsmanship as a theological concern. 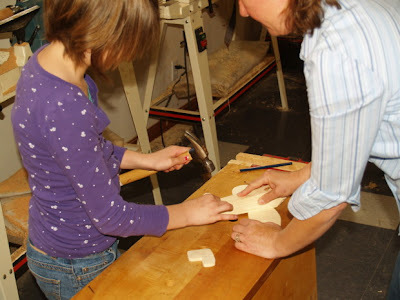 Educational Sloyd proposed that all students through engagement in hands-on learning, crafting beautiful and useful objects from wood, would gain an understanding of the dignity of all labor. Widely shared respect for all labor was seen as the foundation of democratic society. While much of modern society has disparaged the hewers and choppers of wood, there is an honesty about making things from wood. A poorly crafted object describes its maker's lack of care, and care is most certainly the foundation and expression of all morality. Morality as nurtured, learned and expressed through craftsmanship is not limited to Christian theology. Craftsmanship is an essential expression in all human cultural and religious groups. "Let the youth once learn to take a straight shaving off a plank, or draw a fine curve without faltering, or lay a brick level in its mortar, and he has learned a multitude of other matters which no lips of man could ever teach him." Yesterday, I mentioned that there are two things that are unique to the human being, the making of tools and the teaching of their making and use. No doubt, the first tools in common usage amongst our early forebears, were simple sticks used to probe in nests and cavities for insects and honey or stones for crushing nuts and seeds for easier consumption. From there, man began fashioning tools for specific purposes. An example from my own yard that I have shown before in the blog is in the photo below. This stone is only roughly shaped, and was likely discarded when its user moved on to a new location. 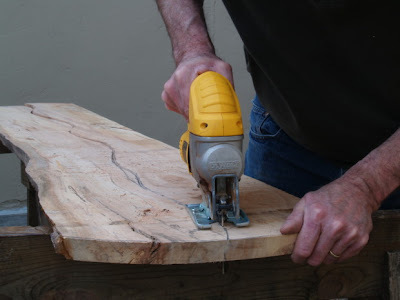 This is kind of like the simple jig I might make in the wood shop to make a task easier, safer or more precise and which is then discarded when the task is complete. This particular stone, though roughly shaped, displays an incredibly sophisticated understanding of the material from which it is made. 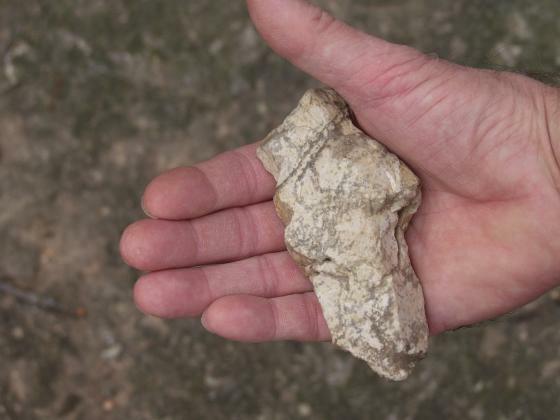 In order to shape this type of chert(a vastly inferior form of flint) into a desired shape to fit the hand requires expertise well beyond that of modern makers. So this stone, being roughly shaped, still expresses triumph of skill in the manipulation of material. With the arrival of tool making our forebears began teaching both the making and using of tools. Thus pedagogy, conscious imparting of skill from one person to another most likely arose, not through the use of voice, but through demonstration... "Hey watch this." And so, in the making and using of tools is recorded the rise of man as the dominant species on the planet Earth, from the first crafted stone tools to the most modern computer. Whether or not we will ever deserve be called wise is dependent on whether or not we can move from mere dominance of the planet to a position of caring stewardship of all species. The Wisdom of the Hands program at Clear Spring School is featured in this month's Lee Valley Woodworking Newsletter. 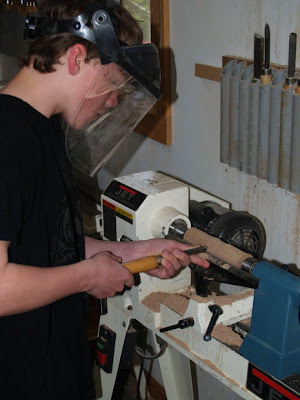 It is a clear description of our woodworking program. 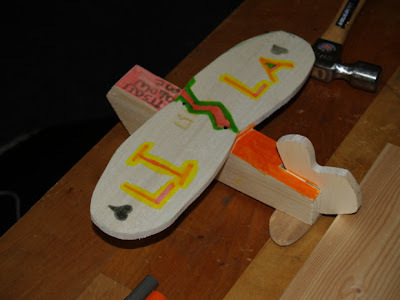 The photos above and below show the kids' work on making toy planes. This was such a great day in the wood shop, and the kids were enthusiastic in expressing their thanks for the opportunity to have so much fun at school. I would hope that every teacher in the world might receive such unsolicited feedback from their students. Yesterday, I mentioned that just as tool making is unique to the human experience, so too, is teaching. No other species demonstrates a conscious pedagogical relationship between generations. You can see in the photo above, the human relationship between adult and child, as teacher assists student in nailing parts of her plane. The idea of advanced technology in schools is to eliminate or diminish the importance of close personal relationship between adult and child, thus restructuring what it means to be a part of the human species. If computers can teach as well or better than real teachers, and replace them by the droves, tremendous amounts of money can be saved, right? Have you been thorugh a self-checkout at Walmart or Home Depot? Works good, right? You scan your stuff, stick your money in a slot, and there is an assistant standing by and watching to make sure you don't cheat. Will that concept be the future of American schooling and the human species? I can tell you that there is a clear joy that arises in a classroom when the adults teach and the children are empowered to create. "Can the hand coexist with the digital in the education of future makers and designers?" That is the question raised at the start of an article on the use of new technologies in craft work in this month's American Craft Magazine. My own answer is not "yes it can," but "yes it must." One of the earliest schools to adapt computer technology, the Tyler School of Art at Temple University, acquired its first 20 Apple IIe's in 1984, but still finds a role for the hands. Associate professor Daniella Kerner observes, "Students fall in love with hand fabrication." Professor, Stanley Lechtzin who acquired the Apple IIe's in 1984 notes, "Without experience of materials, processes, hand tools, and hand manipulation, students lack the experience necessary to be good designers using computer programs, as they don't have the 'feel' and the knowledge of how a jewelry piece is made." The author of the article, Jo Lauria notes: "Thus, the hand empowers the computer in many ways beyond the obvious tap-tap-tapping on the keyboard." In fact, one might say that computer technology is simply one additional step in the 5 million year history of tool making. 35,000 years ago, the handle was discovered, giving the basic hand tools additional force. Two hundred years ago, we began our experimentation with steam and complex machinery to speed production. The hope of many designers is that they can create things that will become mass produced by modern manufacturing processes, devoid of hand, and equally devoid of hand skill, and yet it seems that the effective design of these products requires some hands-on experience of the properties of the material... as the foundation for digital creativity. There is a sensitive quality that can be felt within hand-crafted objects, an indescribable uniqueness. As we have strayed so far from the experience of those feelings, and as we have isolated children from their own hands-on creativity, I wonder if we are losing cultural depth. While in Nebraska last weekend, I drove across the Platte River, which has long been described as a mile wide and an inch deep. Have we created an American culture resembling the Platte River, wide but shallow? If education is a cultural rather than computational process, what are we doing to our schools when we neglect the education of our children's hands? As Clear Spring School is one of very few educational endeavors in the US to put children's hands first, we are likely to find out. I have been reading a several Jerome Bruner books, and in one he noted the difference in teaching methods between the chimpanzee and primitive man. While adult chimpanzees do no direct or conscious teaching, primitive man is often engaged in the process of showing, or demonstrating how to make things, or how to perform certain skilled tasks. And so you can say that pedagogy, teaching, is a uniquely human endeavor. Some will insist that we arose as a species through the use of language, but those of us who work with tools of all kinds know that creative actions shared through the process of demonstration are the true foundation of human culture. Human beings, throughout our long history have been the unabashed makers of things. 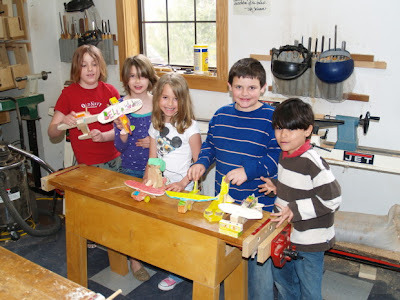 Today the first, second and third grade students will be in the Clear Spring School wood shop. I just want to make something! I am a lot like my student Tyler, 8th grade. He says,"I don't want to spend so much time thinking. I want to make something." When I ask, "Make what?" of course he has many ideas. First is a sword, and when I tell him, no, he asks, "What about a shield?" and from the ensuing conversation with Tyler and others, I discover that they have many ideas of things that they could make that would impart greater meaning in their lives. From the pure intellectual perspective, most would say that the making of objects is of little importance. "We want our kids to become scholars, not tradesmen." But what is really going on in the making of stuff? I am reading Jerome Bruner's book, The Culture of Education and I won't trouble either of us with a deep incursion into academic thought. Some of it is what a craftsman already knows in his or her bones. Bruner distinguishes between education as "computational" process and education as a means through which cultural values and considerations are imparted to children. The computational model is based on what we see in the processing of a computer. As an oversimplification, you put stuff in the brain, the electrons buzz through circuitry, and ideas and concepts pop out on demand, processed and in prescribed order. When you look at schooling as a process of culture, you see that at its core is a simple concept that can be described as meaning. Kids catch on right away whether meaning is there in their schooling or not, and in too many schools children find too little meaning in their educations. If a process of education is to be effective, it must involve what could be described as a dance in partnership with meaning. How do we go from our current model of schooling to the effective engagement of our children in self-motivated life-long learning? While it could be nice if universities and professors could come up with answers, I suspect the truth is something about which one might best ask Tyler. Schools can be the place in which meaning is discovered. For that to happen, it is required that teachers listen. 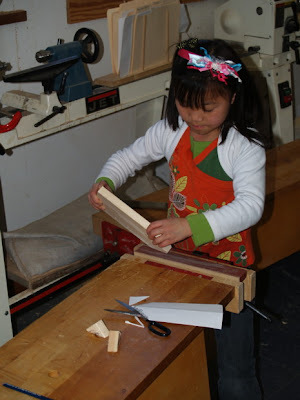 Making things is something that nearly all kids like and introduces greater meaning to their educations. In order for schools and schooling to become truly cultural, we must use them to engage our children's quest for greater meaning in their lives. Human beings, throughout our long history, have been the unabashed makers of things. If we were to reshape our schools as workshops and laboratories, we would provide the means through which greater meaning would be found in our school culture. We don't have home economics in schools anymore. We don't teach children how to cook for themselves, or how to eat well, or how to make the most healthful decisions with regard to one of the most important issues in our lives. Jamie Oliver: "No child should leave school without being able to cook at least 10 healthful recipes. It is called life skills." Life skills as a component in education ceased to be important in most schools when our educational system was blamed for the Russians having embarrassed us through the launch of Sputnik, the first man-made satellite to orbit the earth. Having been beaten by the Russians had nothing to do with what hadn't been taught in schools, and much more to do with the US government having made rocketry a low priority following WW II. But schools, it was claimed, had not paid enough attention to science and math. They, had been wasting our children's time instructing them in how to have meaningful and healthy lives. Besides, learning to do things for themselves, cook, fix, make, sew, would take kids out of the measurable monetary economy. 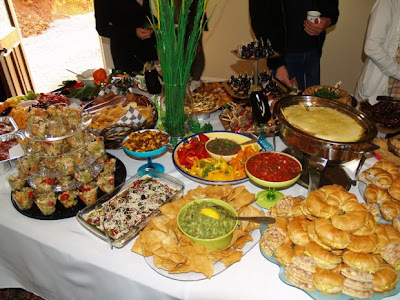 How can politicians and CEO's get their cut when we have cooked, fixed, grown, made, made do, nursed and nurtured our children in a more healthful manner? 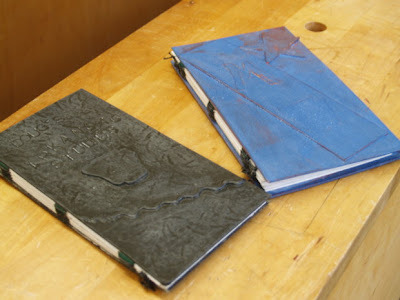 Today, we're back from spring break at Clear Spring School and we are almost finished with our book binding, making journals for school travel. I am impressed when kids have attention for projects that go on for several classes, and this is one they all seem to have enjoyed. Their teacher Michelle, is also very pleased with the results, knowing that journals they have made themselves will make their school travels a richly remembered experience. 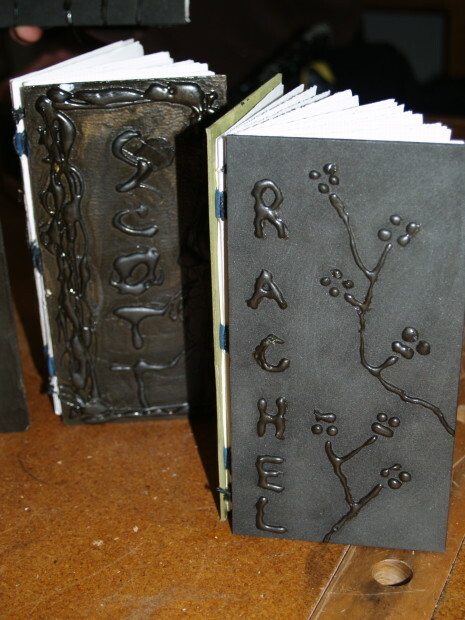 The photo above shows a front cover and a couple sample books are shown below. This month's American Craft magazine has a focus on tools and a couple interesting features that will interest my readers. The first is an essay, Get the Lead Out, by Glenn Adamson. The second is an interview with Henry Petroski, author of a number of books about engineering and creativity, including To Engineer is Human. Salomon, Perkins, and Globerson in the article available for download below, discuss the effects with human-technology partnership vs. effects of or from that partnership on the cognitive abilities of the human involved. Is there a "residual cognitive impact", an improvement in cognitive abilities resulting from use of intelligent technologies. I now want you to add the following column of numbers and then divide by 354. 89, 196, 2438, 13, 197, 33. Were you able to do that easily without using a calculator? I hope so, it was what you learned sometime in 4th, 5th, or 6th grade and have likely forgotten due to reliance on technology. It is obvious to most that partnership with tools of all kinds including computers provides cognitive benefits. Even with relatively simple tools like hammers, saws, pencils, planes and the like, we are smarter with tools than without. It is much less certain whether that partnership has educational value when the particular technology is no longer or not presently available for use. Take a column of numbers and remove the technological device and see what comes next. The partnership with computer tools entails the three major ingredients one finds in a human partnership: (a) a complimentary division of labor that (b) becomes interdependent and that (c) develops over time. Moreover, the partnership is genuinely intellectual; As defined by the concept of intelligent technology, the tool assumes part of the intellectual burden of information processing. For example, spread sheets, statistical packages, and graphing utilities provide the expert with powerful facilities that shortcut the cognitive effort required to produce a professional result, as well as allow a less experienced novice to fashion a respectable product. It is a slippery slope for academicians when even Einstein admits that the lowly pencil made him more clever than he was alone and deviceless. And as a craftsman, I get bored, impatient and somewhat offended by the academic predisposition to adjudge those outside the university environment as having lesser intellect. Is "genuinely intellectual" confined to the efforts and domain of the scholar? I would suggest not. From a craftsman's angle, one might view all tools and their various refinements as having the purpose of alleviating cognitive as well as physical burdens on the operator. Each tool embodied the wisdom and intellect of previous iterations and their makers. As powerful as computers might be at organizing information, tools of all kinds have provided the foundation for scientific discovery and cultural creativity. I can provide many interesting examples and I know you can come up with some on your own. The tragic divide between academia, and the world of skilled craftsmanship has profound implications. As long as we isolate the education of the head from that of the hands, we fail in the most meaningful education of each child. What if we're not as smart as we think we are? Given sufficient mindful engagement in the partnership, strong effects of working with an intelligent partnership can be expected. However, such partnerships challenge our traditional notions about ability. Usually we view ability, regardless of definition, as the potential of a person's mind, the property of that individual. But, once we couple intelligent technologies with a person's ability, the emphasis might shift to examining the joint system. After all, the system, not the individual alone, carries out the intellectual task. Such a reconceptualization of human ability appears at first to be quite novel. But closer examination reveals that we have implicitly accepted it all along. As Olsen* points out, "Almost any form of human cognition requires one to deal productively and imaginatively with some technology. To attempt to characterize intelligence independently of those technologies seems to be a fundamental error." For example, we would not think of testing people's artistic abilities without the use of some medium such as brush and paint. As Pea has recently pointed out, once appropriate intellectual tools are employed, ability becomes distributed by "off-loading" some of the mental operations required unto the artefactual environment. I would add to this discussion the notion that all tools are intended toward the same effect... that of "off-loading" necessary skill, required intellect and attention, distributing these things onto the artefactual environment. *Olsen, D.R. (1986)Intelligence and Literacy: The relationships between intelligence and the technologies of representation and communication. The wide spread assumption is that man gained his intellect through the use of language. While there is direct fossil evidence of the concurrent development of tools and human intellect, the idea that language had very much to do with it is an assumption for which there is no direct evidence. Dig as deep as you like in the fossil record, there is nothing there concerning language and intellect. Do you think the successful promulgation of the assumed discursive link may have something to do with the university settings in which these notions have been put forth and discussed? If you take those whose primary capacity is discourse, gather them together, where they can discuss things among themselves, is there any reason that we might expect them to come up with ideas other than those confined to their own narrow views? Those of narrow view have long held that those who work with their hands using tools are lesser in intellect than those who work with their heads alone. And so, I make this effort to speak on behalf of craftsman, their hands, their tools. This essentially describes the long history of man's relationships with his tools and their use. In our great universities, the tools of the tradesmen have been regarded as mindless and of little meaning. I can assure all, despite intellectual predispositions, that to use a hand plane, one of the simple tools of the woodworking trade, to artful effect, requires skill and attention that are highly dependent on mental capacity. Try it. You might like it and learn something from the experience. The story of the human race is one of ever-increasing intellectual capability. Since our early cave-dwelling ancestors, our brains have gotten no bigger, our hands no more nimble, but there has been a steady accretion of tools for intellectual work--how to grow crops, domesticate animals, build shelters, paint paintings. It includes governing and inspiring and, unfortunately, waging wars. It includes how to build and operate airlines, television sets, and football teams. This shared capacity was first manifest in language, later in writing, math and science, and in the huge collections of experience and discovery stored in books and libraries. By comparison with our forebears, each of us has become a genius. From The Trouble With Computers, 1995, MIT Press. Page 365. While there is no way to prove it, I suspect Landauer misstates the beginning of it all which was no more likely the result of language, than of the first humans making and using tools. Due to the fossil record, we have evidence of tools and their role in the expansion of intellect in early man, but no evidence of language having that same effect. Jerome Bruner: "...how the mind works is itself dependent on the tools at its disposal. How the hand works for example, cannot be fully appreciated unless one also takes into account whether it is equipped with a screwdriver, a pair of scissors..."
Albert Einstein: "My pencil and I are more clever than I." Each tool in the human arsenal can be used with skill and attention or mindlessly in the abuse and destruction of material and form. In that way, the tools of the scholar and craftsman are just alike. This same applies to a chisel, a saw, or the most powerful computers currently in operation. The assumption, of course, has been that tools of the hand are less mindful, requiring less attention, less intelligence, than those tools of ever increasing capacity, and thus impart less status, less prestige to the skilled user and are thus less deserving of reward. The fact of the matter in the long term is reversed. Growth in complexity and power of tools is intended to eliminate the need for skill and attention. When new tools with greater power are introduced, there is a temporary need for specialized skills in the workplace until such time as the human-to-tool interface is refined to bring the technology to ease of use and thus eliminate the need for skill that the new technology had introduced in the first place. And so the simple tools of the craftsman tell the story of civilization, growth of character and purpose, with greater sincerity than the wondrous mechanism that spews entertainment into the mass media. The difference is one of scale. It is hard to replicate in mindless manner the attentions of hand and chisel to wood. On the other hand, things made by a simple craftsman can last centuries. So what is the engaging narrative of our civilization, or rather, what stories are those that should be told, from generation to generation? Would we rather be described as an incessant march toward mindlessness? The human care and attention required for the growth of skilled craftsmanship is a step in the other direction. The history of the human race is one of increasing intellectual capability. Since the time of our early ancestors, our brains have gotten no bigger (our hands no more nimble); nevertheless, there has been a steady accretion of new tools for intellectual work... and an increasing distribution of complex activities among many minds. Despite this transcendence of human cognition beyond what is “inside” a person’s head, most studies and frameworks on cognition have disregarded the social, physical, and artifactual surroundings in which cognition and human activity take place. This simple quote opens the door wide to an understanding that development of human intelligence, both in and out of schooling, is dependent on the relationship between the mind, the hands, and our tools (of all kinds). And so, if we wish to extend human intelligence through schooling, it won't be by having children sit still at their desks, hands stilled and intelligence silenced. What is the purpose of sculpture? Is it simply to gather dust, take up space and require cleaning? Or is it a way to bring fresh perspective to our lives? Open our eyes to some form of beauty as yet unseen? These are three views of the piece I just finished, or you could say a total of five views, two discurisive and three being photographic as seen above and below. 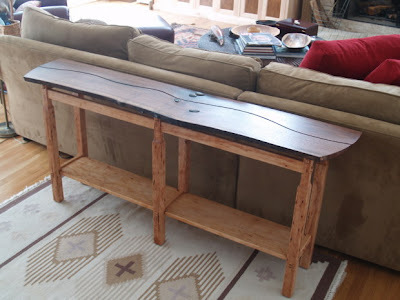 The students at Clear Spring School are off for spring break, so I will be cleaning, organizing the two shops (home and school) and working on tongue and groove cherry parts for cladding a kitchen island. Today I celebrate with thousands of other teachers across the US. No Child Left Behind Legislation is being radically altered by the current administration to allow the arts and history to be considered important components of school curriculum. Today I am trying to remember the name of the craftsman in the UK who described the markings of a plane in the finishing of a table top as ligature. This is related to the notion that every tool leaves its mark that can be read, by someone experienced in its use. If any of my readers can help, please respond. Perhaps one of my UK readers can help. Is there a relationship between the markings of tools used in creating crafted work and ligature, a word that has a variety of meanings in other human endeavors? While it seems that cutting away a hand planed surface would be completely unrelated to tying loose ends, in essence the carefully laid markings of caring craftsmanship can create a surface as deeply expressive of human attention as finely woven cloth... as expressive of emotion to some as ligature in music. The interesting thing is that we take objects for granted, seldom exploring the story they tell and failing to see the depth of their meaning. But if objects did not relate the narrative of human history, we would be content with having libraries alone as the expression of human culture. No museums would be necessary. The image above is a diagram of the joggled hull construction of an Egyptian boat with the ligature locations, where the planks are stitched to each other marked in the straight lines. All boat-builders solve similar problems, and some of the worst problems are weakness and leaks generated by planks moving against one another along their edges (longitudinal slippage) (Coates 1985). 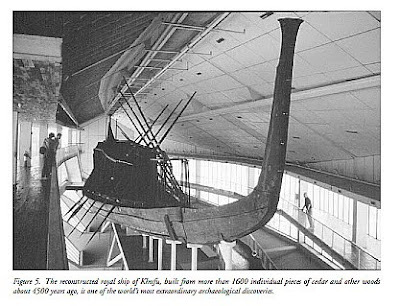 To combat slippage, Mediterranean shipwrights used locked (pegged) mortise-and-tenon joints as seen in the late fourteenth century BC Uluburun ship (Pulak 1998). In Egypt, however, the only use of locked mortise-and-tenon joints is in prefabricated panels on the Khufu ships’ cabins, a repair to a plank on the Carnegie Dashur boat, and in a repair to a mortise-and-tenon joint in a Lisht plank (Ward 2000: 67, 98, 112). Rather than locking joints, the Egyptian boat-builders fastened planks with symmetrically placed ligatures, single ‘stitches’ connecting adjacent planks, and used joggles, small notches cut along plank edges to ﬁt precisely into a recess on an adjacent plank, to effectively stop slippage (Figure 6). The quote and images above and below are from Boat-building and its social context in early Egypt by Cheryl Ward. Click title to download pdf. 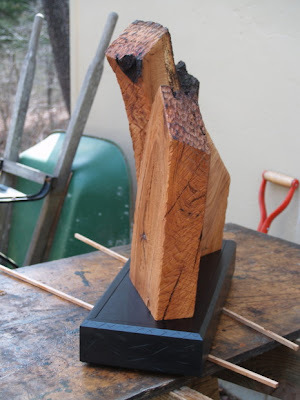 After sanding and drilling the holes to attach the sculpture to the base, I've used leather dye to blacken the base and clear Danish oil to bring the red oak to life. After a couple more coats and some hand polishing, the sculpture will be ready to assemble and sell. 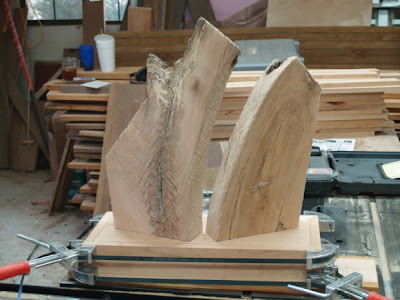 In this case, the work is defined by the path of the band saw, separating a single slab into two parts rearranged in separate planes. 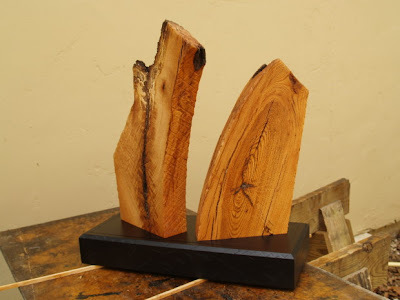 The black base will offer a dramatic contrast to the highly polished red oak as you will see in a later post. Having considered three characteristics of narrative—its sequentiality, its factual "indifference," and its unique way of managing departures from the canonical—we must turn now to its dramatic quality. Kenneth Burke's classic discussion of "dramatism," as he called it nearly a half-century ago, still serves well as a starting point. Well-formed stories, Burke proposed, are composed of a pentad of an Actor, an Action, a Goal, a Scene, and an Instrument—plus Trouble. Trouble consists of an imbalance between any of the five elements of the pentad: an Action toward a Goal is inappropriate in a particular Scene, as with Don Quixote's antic maneuvers in search of chivalric ends; an Actor does not fit the Scene, as with Portnoy in Jerusalem or Nora in A Doll's House, or there is a dual Scene as in spy thrillers, or a confusion of Goals as with Emma Bovary. Dramatism, in Burke's sense, focuses upon deviations from the canonical that have moral consequences—deviations related to legitimacy, moral commitment, values. Stories must necessarily, then, relate to what is morally valued, morally appropriate, or morally uncertain. The very notion of Trouble presupposes that Actions should fit Goals appropriately, Scenes be suited to Instruments, and so on to completion, are explorations in the limits of legitimacy, as Hayden White has pointed out. I think that you can see that craftsmanship, where the craftsman has pushed the limits of his or her own creative imagination, physical and technical capacities is the breeding grounds supreme for "trouble." In the piece shown above and in the earlier post, much of the trouble was presented by the challenging nature of the materials used and resolved through the inlay of stones. The walnut stock with its many imperfections challenged the craftsman's creative response. 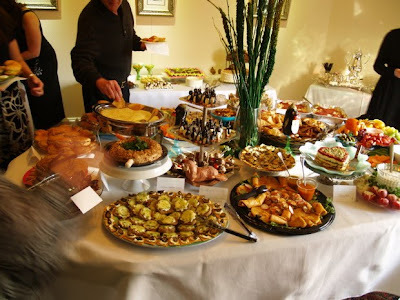 Take away the trouble, the resultant "dramatism" and crafts become as humdrum as a breakfast of toast, no butter, no jam. A craftsman, seeking growth and knowing the value of narrative, pushes his or her own limits. Those limits may be limitations in materials, or in tools, or in expertise, or in creative imagination. Can you see that crafts can be as rich an avenue for the expression of cultural narrative as any form of discursive art? As the craftsman wrestles to find solutions in the successful completion of work he or she works to resolve moral uncertainties and the work is seldom fictional. It is not merely pretense nor imagination, it is the real deal, the maker's moral character expressed in wood. 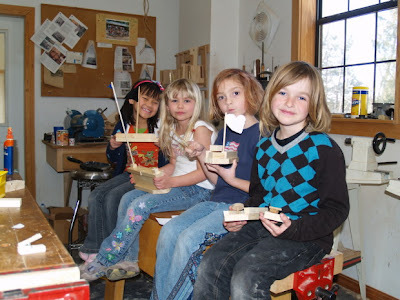 Can you see why woodworking in schools was proposed as a component of formative education? and that it was proposed for all regardless of educational aspirations? To make something of useful beauty is one of the highest expressions of human caring and capacity... Something that can and should be taught in schools if we want our children to creatively engage the 21st century. The first characteristic of narrative is what Jerome Bruner describes as its "inherent sequentiality: a narrative is composed of a unique sequence of events, mental states, happenings involving human beings as characters or actors." Bruner's second feature of narrative is that it can be "real" or "imaginary" without loss of its power as a story. Hence the power of well crafted fiction. Bruner's third crucial feature is that "it specializes in forging of links between the exceptional and the ordinary." That which is canonical or normal and by the rules, or noncanonical, breaking or transgressing the expected norms. My point, in case you didn't already guess, is that narrative may be as strongly present in hand crafted work as in speech and written discourse, and in some cases can be more powerful. We place far greater value as a culture on written or spoken narrative and place far greater emphasis in education on discursive narrative than on that which is expressed by hand. And so part of coming to better terms with the value of crafted work lies in understanding its narrative role in human culture. Our objects describe who we are, where we are going, and the means through which we will arrive at our greatest potential. As I am fighting a cold and sinus infection, I'll not be at my best, but will offer these photos above and below of a recent piece of furniture showing narrative qualities in conformity with what Bruner outlines above. You will note that this table connects normal and unusual or exceptional elements in the same work. The contrast between the natural edged top board and the more conventional mortised and tenoned base is an example. While some viewers familiar with the process of crafting such work would know the sequence of operations the work records and describes, a casual viewer is drawn to skim or read it sequentially, just as one might skim or read a published text. Each and every piece of hand-crafted work is autobiographical in that it records and describes the maker's character as well as his motions in making the piece. 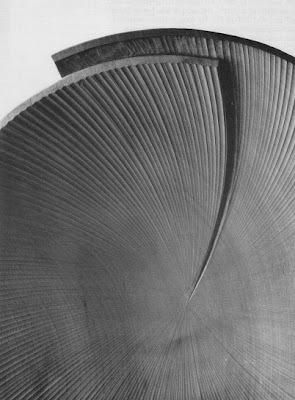 The meander cut through the center of the board is used symbolically in a fictional representation of a river or stream, while also allowing use of a traditional technique--the sliding dovetail joint. 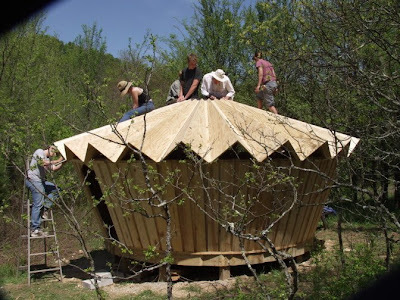 And so, I hope my regular readers will understand that story telling, the foundation of human culture, is not just something that happens through words alone, but can take place whenever the human hand goes to work on wood. We think of intelligence and knowledge as being inside our heads, and yet that is only one theory. The following is from Jerome Bruner's Acts of Meaning and points towards an understanding of the craftsman's use of embodied knowledge, that of tool and hand familiar in its use. Consider first how contextualism affects ideas about knowledge and how we acquire it. As Roy Pea, David Perkins, and others now put it, a "person's" knowledge is not just in one's own head, in "person solo," but in the notes that one has put into accessible notebooks, in the books with underlined passages on one's shelves, in the handbooks one has learned how to consult, in the information sources one has hitched up to the computer, in the friends one can call up to get a reference or a "steer," and so on almost endlessly. All of these, as Perkins points out, are parts of the knowledge flow of which one has become a part. And that flow even includes those highly conventionalized forms of rhetoric that we use for justifying and explaining what we are doing, each tailored to and "scaffolded" by the occasion of use. Coming to know anything, in this sense, is both situated and (to use the Pea-Perkins term) distributed. To overlook this situated-distributed nature of knowledge and knowing is to lose sight not only of the cultural nature of knowledge but of the correspondingly cultural nature of knowledge acquisition. Ann Brown and Joseph Campione add another dimension to this picture of distribution. Schools, they note, are themselves "communities of learning or thinking" in which there are procedures, models, feedback channels, and the like that determine how, what, how much, and in what form a child "learns." The word learns deserves its quotation marks, since what the learning child is doing is participating in a kind of cultural geography that sustains and shapes what he or she is doing, and without which there would, as it were, be no learning. As David Perkins puts it at the end of his discussion,perhaps the "proper person is better conceived . . . not as the pure and enduring nucleus but [as] the sum and swarm of participations." This passage helps to explain Maslow's proposition that those only having hammers will see all problems as nails, and may help some to understand why our schools need to be filled with tools of all kinds. With tools, we can turn our school cultures from idle supposition to discovery and creativity. To paraphrase Thomas Carlysle, without tools man is nothing, with tools, all. I've spent the last two days laid up and off from school with sinus headaches and head cold. I'm not sick often, but the fact that I can sit up and write on the blog I take as a good sign. I have been reading Jerome Bruner's Acts of Meaning which is an exploration of the role of narrative in human culture. 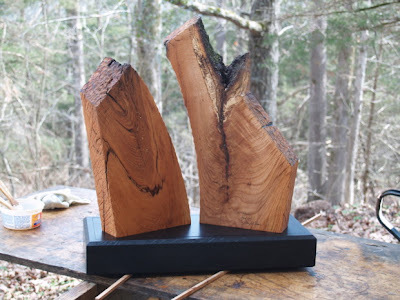 You will have noted that I regard creative action in the wood shop to be form of narrative... that narrative can consist of far more than just the written and spoken word. A well crafted, beautiful and useful object is narrative in that it describes to an informed viewer the skill and character of its maker. I find it fascinating to listen to my student's conversations as they work in the wood shop. Their narratives are revealing. Whereas children would have once referenced their own lives in their discourse, "I did this and we did that", now so much of their narrative is repetition from what they have seen in movies, TV programs or video games. Their own lives seem to not be interesting enough in comparison to the prepackaged narratives sold to their generation by the entertainment industry. I am not sure what this all means, and I am puzzled by Bruner's title, Acts of Meaning. We know that narrative is a powerful force in human culture. I am hoping that as my sinus headache clears greater clarity will come. And so in this interesting list of narrative forms you, if you are a craftsman will see a glaring oversight... that of crafts. Are crafts a narrative expression? If you begin to understand that they are, it can change the way that they are viewed. It can change also the way we work as we ask, "what is the story here that I am trying to tell?" It is my contention that the physical realities engaged through the making of beautiful and useful objects is more vital, more sincere than those narrative forms dependent on written or spoken words alone. 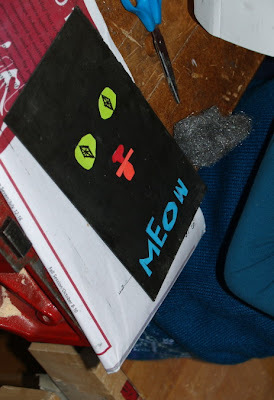 It is tragic that many viewers of crafts know too little of the creative language of form and technique to understand the narrative content. The story of how things are made is richly entertaining. And so it is with making a box. Like a poet, great playwright or novelist, a craftsman is also engaged in narration, revealing his or her own creative soul in material story form. On another subject, Diane Ravitch has a new book out about education called the Death and Life of the Great American School. It is refreshing to see such intellectual honesty. As noted in a Time Magazine review, "It is always fascinating to see someone renounce previously held beliefs." Ravitch, as Assistant Secretary of Education had been a passionate supporter of charter schools, standardized testing and merit pay, but now offers a 180 degree contrary view to the current educational reform movement. As mentioned in the Time Magazine review, "such unabashed 180s are a rare sight both in politics--where an opinion once stated is by necessity an opinion forever defended--and in academia, which is only slightly less afflicted by the cult of the certain." Time gives Ravitch's new book a "read" rather than skim or toss rating. A simple wooden box can be a very complicated array of decisions and opportunities, and this is the simple diagram of options suggested by my weekend class in Dayton. You can click on the image for a larger view. I had a long day yesterday completing my box making class for 43 Western Ohio Woodworkers and then flying back to Arkansas. A canceled flight and waiting on standby brought additional stress, so it is good to be home. In the photo above, I'm pointing to my simple fix for a big error while cutting miter key slots. It is often a challenge working with tools that are not your own, and making do with what you've got. But mistakes when teaching are an effective tool for gaining and keeping student attention. It is also interesting to work with a class that is so interested in the subject material. Working with kids, they are sometimes not sure if they are interested or not, so you have to work harder for their attention on that count alone, and with students being well versed in rapid fire use of consumer electronics and most accustomed in its use, it is a particular challenge to grab their attention. Standing in front of a class as a real human being one competes with a panoply of made up Hollywood characterizations, and it is hard to compete. My mother, as a kindergarten teacher had noted the effect of rapid fire children's programming on her students' ability to pay attention in class, and that was thirty years ago that that started. It has gotten steadily worse. Now we have much more challenging minds to gather into learning. One of the things that engage all human beings is narrative. Is there a story taking place in the classroom. My having made a mistake in my cut on the corners of the box, engaged, (as it always does) my students in wondering, "what will he do now?" "Will he fix it, and how?" And so the box was left to be auctioned off for the club scholarship fund. It is now a narrative work, telling the story of our two days in Dayton, and having recorded both an error and fix, though it will be a story only those present will be able to read. More photos of the workshop can be found here. There is an interesting article in the New York Times sent to me as a link by former shop teacher Reuben. Building a Better Teacher explores the question, Are there classroom management styles and teaching methods that provide better results? No doubt the answer is yes. It is a lengthy read but interesting and of probable value to teachers. My thanks to Reuben for the link. It would be a wonderful thing if education could be brought to its best by tweaking our teachers and refining teaching styles and methods. We know that teaching is more art than science and just as in any art or craft, there is no exact limit to a teacher's potential for improvement and growth. But if we are really concerned about the futures of our community, nation and planet, the education of hearts, minds and hands will be required. The strategic engagement of the hands is the best place to start. Today I finish my box making class in Dayton and return home to Arkansas. This morning I start my class with Western Ohio Woodworkers, and I'll have about 30 adult students. There is an important human compulsion to be making. And yet, we have created lives for our children in which they are idly entertained rather than busily making things of useful beauty. Parents enjoy having their children engaged in their electronic devices. When we check on our kids and they aren't whining, we must must be doing something right, right? Update. I was too busy today to take any photos. I had 43 students instead of the expected 30. So, it was a great day. And the club did better than break even on expenses. Our environment in its visible aspect owes far more to workmanship than we realize. There is in the man made world a whole domain of quality which is not the result of design and owes little to the designer. On the contrary, indeed, the designer is deep in its debt, for every card in his hand was put there originally by the workman. No architect could specify ashlar until a mason had perfected it and shown him that it could be done. Designers have only been able to exist by exploiting what workmen have evolved or invented. 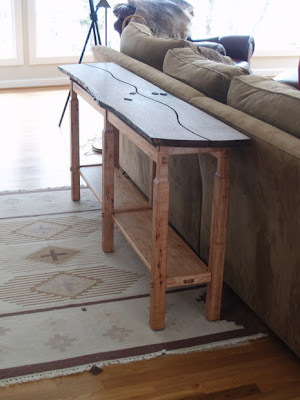 When I was growing as a craftsman, I kept meeting other woodworkers who had claims of themselves as being "designers" and whose hopes were to sell their ideas to manufacturers for the big bucks. There is a broader view of that. You design things based on the experience of real craftsmen, then harness unskilled labor to the commands and demands of the machine to do the work. But there is a simplicity and grace in being a craftsman, a common maker of things, that transcends all else. The designers will come and pirate the contributions we make, but will have little deep joy in the process of creation. The image above is of David Pye's work. Today I'll be traveling to Dayton to teach box making. There are concurrent effects to the growth of skill, that we seem to have completely forgotten in our race to make production unskilled and mindless. This chart is offered as a reminder. When you buy beautifully crafted work, you sustain the growth of a craftsman and build community at the same time. 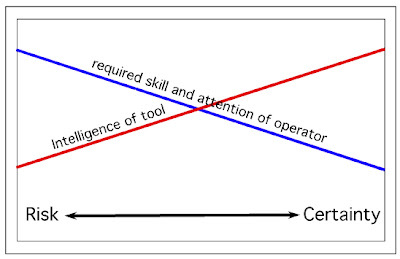 These simple charts are intended to illustrate the relationship between the development of more efficient tools, and the required level of skill and attention in their use. In the last century, workers in manufacturing went from skilled labor to less and less skilled labor, as the tools and tool processes became more and more efficient. 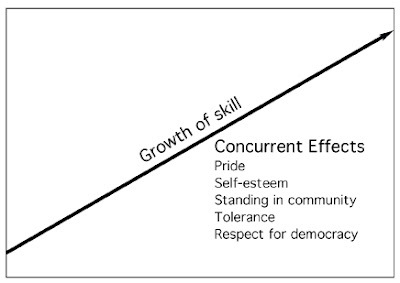 The inverse relationship between necessary skill and intelligence seems to apply in the computer programming world as well. The first chart concerns growth in tool complexity, accuracy and complexity, and the second correlates the same effect with David Pye's concepts, workmanship of risk and workmanship of certainty. As tools are developed to eliminate margin of error, or to compensate for the inattention of the operator, required skill declines. These simple charts may help to explain why so many wood workers like to work with hand tools. Skill and attention are matters that create feelings of self-worth and accomplishment. They are the soft side of harsh reality, and the human component that compels engagement in physical and cultural reality. If you compare a chisel and a plane, you will find that they each share the same geometry at the cutting edge, and yet they are designed for different tasks. You will note that the frame surrounding the blade of the plane holds it in a fixed angle in relation to the working surface. Given enough strength, super human attention, and uncommon skill you could do with the chisel what you do with the plane, but then for most of us mortals, getting the plane to make perfectly smooth surfaces on wood, is challenge enough. 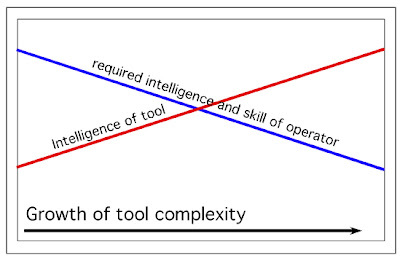 My point here is to explore David Pye's concept, workmanship of certainty vs. workmanship of risk and you can see that the evolution of the same cutting edge from simple application in the chisel to complex application in the plane is intended to bring greater certainty in a particular operation, replacing the need for skill with a more complex technology. The same can be said for the entire history of tool development. Almost all technological progress is aimed toward the elimination of skill as a necessary component of development. Another example is the biblical story of David and Goliath. David killed Goliath with a rock and sling, whereas any nincompoop with a rifle could have done the same thing. If you read the latest woodworking magazine, you will find it filled with devices and techniques intended to make things easier, better, directed toward the elimination of risk. And yet, it is risk, not knowing the outcome, working against the odds, putting forth effort, and accomplishing things that express mindfulness, effort and skill, that make life and the things we make most meaningful. And so, what this boils down to is that at least some good measure of what we do should be done the hard way. Choose your tools wisely, that they allow for the development of your skill. In wood shop today, the 2nd and third grade students worked on making toy airplanes, and the first grade students worked on boats. We use a paper folding and cutting technique to help develop the designs. The children love taking the basic idea and then personalizing their projects through use of their own imaginations. 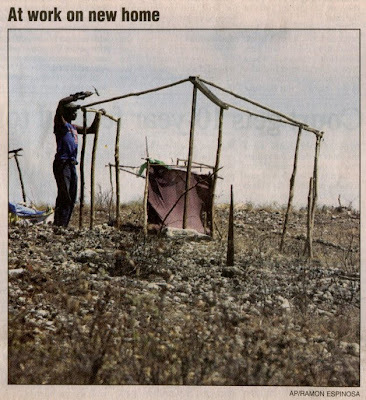 Today in Haiti, men and women are attempting to rebuild their lives and their homes, and I found this photo from the Sunday Arkansas Democrat-Gazette of compelling interest. Deforestation from the colonial slave days and poverty are hand in glove. When we saw the collapse of buildings in Port-au-Prince, we saw no wood used in their construction and far too little steel. Visitors to Haiti and its same island neighbor, Dominican Republic, note the profound difference between the countries. One has trees and the other does not. Those of us who have the untold wealth of forests may indeed count many blessings. I am getting prepared for travel to Dayton, Ohio on Friday for a two day seminar in box making for the Western Ohio Woodworkers. Click on the preceding link for more information. How do we incentivize teaching? Should business be our model? What if the business model is complete idiocy? What if bonuses don't work to stimulate creative behavior? What if bonuses actually prevent teachers and business employees from being most creative and productive? That is the question proposed by Daniel H. Pink at TED. Intrinsic vs. extrinsic motivation. Autonomy, mastery, purpose. In the early days of manual arts training, it was argued that an hour in wood shop was equal in intellectual development to an hour spent in conventional academic lessons, though I suspect the intellectual development would be far greater for those in wood shop actively involved vs. those bored sleeping their way through classes. And so it is all relative. "No extent of acquaintance with the meanings of words can give the power of forming correct inferences respecting causes and effects. The constant habit of drawing conclusions from data, and then of verifying those conclusions by observation and experiment can alone give the power of judging correctly." Crafts present the child's first opportunities to explore the material world, as to material properties, and as to cause and effect in the use of tools to manipulate form. 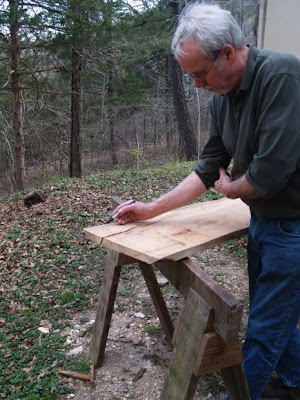 The simple tools of the craftsman provide profound learning opportunities that we'd best not ignore. Today in the Clear Spring School wood shop, 7th, 8th and 9th grade students will continue book binding, and the 10th, 11th and 12th grade students will work on independent projects. 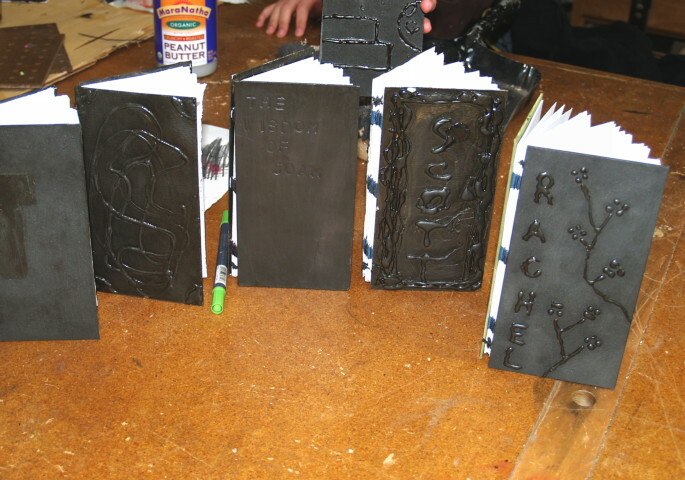 The book binders are designing and making covers as shown in the photo above.